My Journey from a new Embroiderer to The Embroidery Coach! I am Joyce Jagger, The Embroidery Coach and I simplify the business of embroidery into easy to understand lessons for the new embroiderer. My passion is to help get the new embroiderer off to a fast start and help the existing embroiderer improve their skills so that they can provide higher quality embroidery and increase their profitability! I have spent my entire life sewing and creating many one of a kind gift items, home decorating projects and clothing for myself and my children. I started my embroidery business in 1978 after my youngest daughter went off to college. The small home based business grew into a medium sized successful multi-head embroidery business. Creating gifts for weddings, birthdays and any other occasion is something that I always enjoyed! One day a friend of mine asked me if I would like to embroider names on some jackets for him. He had a sporting goods store and wanted to offer this service to his customers. That was the beginning of my embroidery career! In 1978 I started with a free hand embroidery machine in the basement of my home. Despite all of the troubles, issues and mistakes that I made; my business grew very quickly and I moved out of my home into a retail location. I soon needed to purchase a computerized embroidery machine and decided to go to the bank to borrow the money. Borrowing money from the bank was not quite as easy as I thought it would be. The loan officer told me I needed a Business Plan. I had never even heard of a Business Plan! The loan officer directed me to the Small Business Administration and with their help, I created my first one. That Business Plan saw many updates and I have created many more since that time. Starting a business without a plan and without the knowledge of how to run a business is not a good idea. During that time I made so many costly mistakes, I had a lot of struggles to go through and I did not have anyone that I could turn to for help. I almost lost my business because I did not know how to price my embroidery to create a profit. I thought that I had to be the lowest priced embroiderer in the area in order to get any work. My accountant came to the rescue and helped me create a total pricing structure and it really changed my whole business! In 1998, I sold my business and decided to retire; however, retirement did not work out for me! 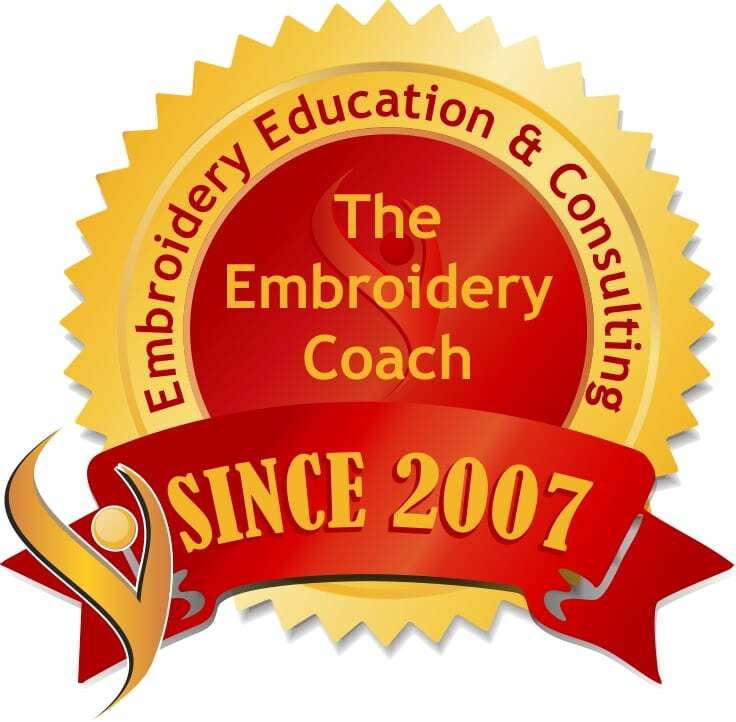 In 2000 I started Designer Marketing Inc., my own training and consulting business, as The Embroidery Coach, helping new embroiderers get started and helping existing embroiderers increase their bottom line. My goal is to see that every embroiderer has all of the right systems, processes and tools in place from the very beginning of their business. If you are someone that has already started your embroidery business and is not seeing a good profit, then we need to talk! 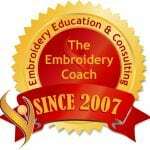 In my on-line Embroidery Video Training membership site I teach all phases of the embroidery basics. There are over 250 videos on-line ranging from machine basics to how to hoop and embroider many types of garments along with several design programs to help you create higher quality designs. I even show you how to repair mistakes! I also teach the Tajima by Pulse DG/ML software and training is available on-site at your location, in my office or on-line. This software training is available for all levels of the Tajima by Pulse software and for all student skill levels. Through my book The Truth About Embroidery Business Success, 7 Elements to a Highly Profitable Home-Based Embroidery Business, I have been able to guide new embroidery startups and prospective embroiderers in the right direction to help them get started properly. I have had the honor of helping hundreds of embroiderers get started with their embroidery businesses‚’ and it is very gratifying for me to watch them grow. 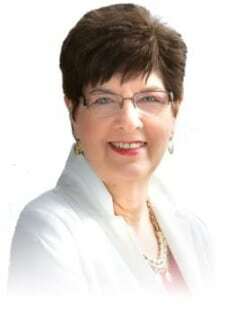 I have written many articles for Stitches Magazine, Wearables Magazine and Printwear Magazine, and I have been a speaker at the NBM Tradeshows and the ASI Show in Chicago. This has allowed me to personally meet a lot of great people that are already in the Embroidery Business or are thinking about starting their own Embroidery Business. As an Advisory Board of an embroidery trade magazine,Stitches Magazine‚ I am a contributing expert to “The Business Spotlight‚ in that magazine. I have also written articles that are featured in Ezine Articles on the internet. “Stitches Magazine” honored me in June of 2010 with the distinction of being one of Creative Thinkers‚ and in December of 2010 #28 of 56 ‚Most Powerful People in the apparel decorating industry! It was also my privilege to help the Apparel & Design Department at “Rhode Island School of Design” add Embroidery to their curriculum. They were really great people to work with and teach. I know that they are going to be very successful with their new program. My Mission Is To Make Life Easier For Embroiderers And Give Them The Right Tools To Run Their Embroidery Business! I am very upset with the amount of embroidery businesses‚’ that have gone out of business when this was totally unnecessary! It is not their fault, they did not have the right tools to get started with and they were totally handicapped right from the first day they started their business. The Embroidery Machine Companies Do Not give you the Right Tools to help you get started in your Embroidery Business! The embroidery machine companies sell you the equipment and tell you that you can have a great business making a lot of money but they do not help you in any way to learn how to run your business or make money! Sometimes there is a paragraph in a manual about each subject that is absolutely no help to that new embroiderer at all! They are told that they need a business plan and that they need to market their business. That is all well and good, but how do you do that? How do you write the business plan? How to do market your business? How do you price your products? Where do you start when it comes to training someone to help you in your business? They just leave you hanging and have no training in these areas at all. Their primary function is to keep the machine sales going. I Would Like to Make Sure You have the Right Tools Before you begin Your Embroidery Business! If I had the power to make any changes in the way that an embroidery business is started, I would definitely structure a program that would teach these new embroiderers about how to make money before they could actually start their business. They have so much to learn after they have their machine in the area of how to embroider and the part of the business that is actually going to make them money, like planning, marketing, pricing, training, these items are not even covered. I Want to SAVE you Time and Decrease your Learning Curve! I started this embroidery training business because I did not want to see other embroiderers have to go through the long learning curve that I did. It took me years to learn how to run the business and learn how to make a profit. This is not the way that it should be! I see so many embroiderers struggling and they just go deeper into debt and do not know how to climb out. I know how that feels, I have been there. I kept borrowing money and going deeper into debt before I finally learned how to price my products to make any money. I just kept struggling and yet I did not know how to make a change. If you think doing the same thing day in and day out and hoping that it is going to change, you are in for a big surprise. You have to take action, invest in your business and make it happen. It does not happen without help and guidance. After almost losing my business, my accountant helped me develop a plan that pulled me out of the red and into the black. It took a while for me to really start seeing progress, but when I did I was so excited and I felt like shouting from the roof tops! I love the embroidery business and the last thing that I ever wanted to do was go out of business because I could not make a profit! I want to share with you what I have learned and make it easier for you so that you do not have to go through all of the bad experiences that I did! What Embroiderers say about The Embroidery Coach!